Columbus Cove runs along the the southern part of the peninsula. The beach water is sheltered and there is a white sandy beach with trees that go down to the water's edge. This family friendly spot is located in a protected cove that allows for swimming and floating on a beach mat. Trees along the sandy beach provide natural shade great for relaxation. Columbus Cove boasts one of the largest aqua parks in the Caribbean. If you want to water toys with your beach day, then this is the place for you. 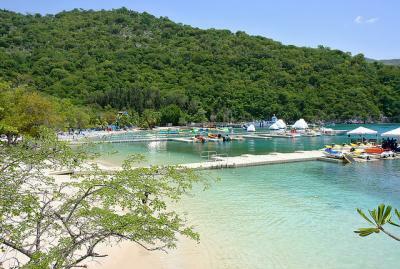 Columbus Cove features the Arawak Aqua Park along with Dragon’s Splash Waterslide. The young and young at heart alike will enjoy family activities. This is also the site of one of our barbecue lunch buffet areas.